KCKCC’s Foerschler joining Central Missouri baseball staff – Welcome to Wyandotte Daily! A former Kansas City Kansas Community College standout is on his way up the collegiate coaching ladder. A Gold Glove winner at KCKCC in 2015, Tanner Foerschler is joining the baseball coaching staff at the University of Central Missouri in Warrensburg as a graduate assistant coach. The move will enable Foerschler to continue his pursuit of a master’s degree in kinesiology. A two-year starter at KCKCC in 2014-2015, Foerschler played two years at William Jewell College and then returned to KCKCC as a graduate assistant coach. “I’m really looking forward for the opportunity to coach at a different level – and at a good college,” Foerschler said. Newly married, he was wed to Kourtney McKinnis June 7. 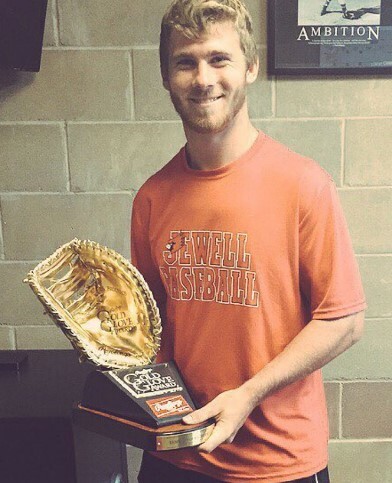 As a sophomore at KCKCC in 2015, Foerschler was awarded the Rawlings Golf Glove for being the best fielding first baseman in the NJCAA (National Junior College Athletic Association) with a .995 fielding percentage. In addition, he was named the recipient of the Mike Haen Hustle Award given annually to a player selected by the coaching staff for leadership and other contributions to the program. “A good coach now, great coach later,” said Steve Burleson, an NJCAA Hall of Fame coach who was head coach during Foerschler’s two years as a player. “As a player, he was our Swiss Army knife. He could and would play any position for use. A dream to coach, he took everything we gave him and added an incredible amount of work ethic to become the player he became. A graduate of Harrisonville High School, Foerschler hit just .211 and drove in 19 runs in 53 games as a freshman but then blossomed at a sophomore, hitting .376 and driving in 52 runs in 57 games. Playing second base at William Jewell, Foerschler hit .267 as a junior and .308 as a sophomore. Third in hitting for the Cardinals, he had 57 hits in 49 games. At Central Missouri, Foerschler will be reunited with another former KCKCC assistant, Damian Stambersky. The Mules are coming off an outstanding spring season, finishing 39-17 and winning the MIAA tournament championship. Advancing to the NCAA Division II regional tournament, UCM won its first two games before being eliminated by No. 1 ranked Southern Arkansas.